A great way to work on comprehension, order of events, and language skills is through story-telling. A couple months ago, we shared a Sequencing Stick for the much loved story, A Very Hungry Caterpillar. 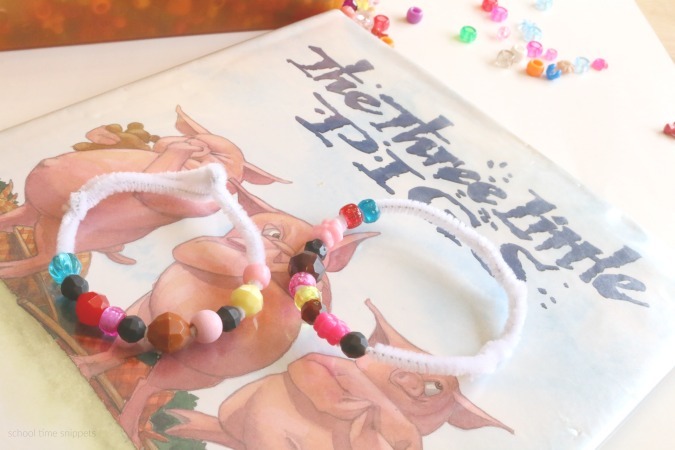 For this month's Bookspiration "Fairy Tale" Theme, we chose to make a story-telling bracelet to go along with The Three Little Pigs. I first read the story to my 5 and 3 year old-- as they have not heard the story before! For the second reading, I brought out our stash of beads and pipe cleaners. I read the story a second time, this time pausing in several places so that we could recreate the story using beads. We first picked three pink beads for the each of the little pigs. 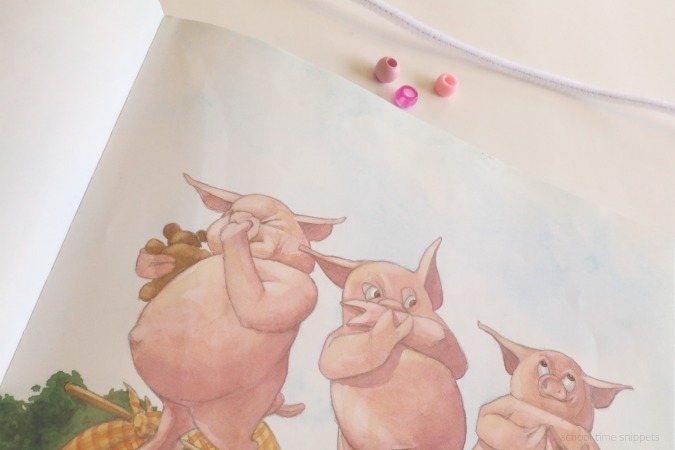 As we read about the first little pig who made his house of straw, we threaded a pink bead onto the pipe cleaner followed by a bead that reminded us of straw: a yellow bead. When the big bad wolf appeared, we threaded another bead onto our story-telling bracelet: a gray or black bead to represent the wolf. We continued until the story was complete. For the second pig, we threaded another pink bead onto our bracelet and added a brown bead to represent his house made of twigs. When the wolf appeared, we again added a gray or black bead onto our bracelet. For the third pig, we threaded our last pink bead onto our bracelet followed by a red bead to represent his house made of brick. When the wolf appeared, we again added a gray or black bead to our bracelet. However, since the third pig was quite wise and added a pot of boiling water to the fireplace awaiting the wolf, we finished off our story-telling bracelet by adding a blue bead. 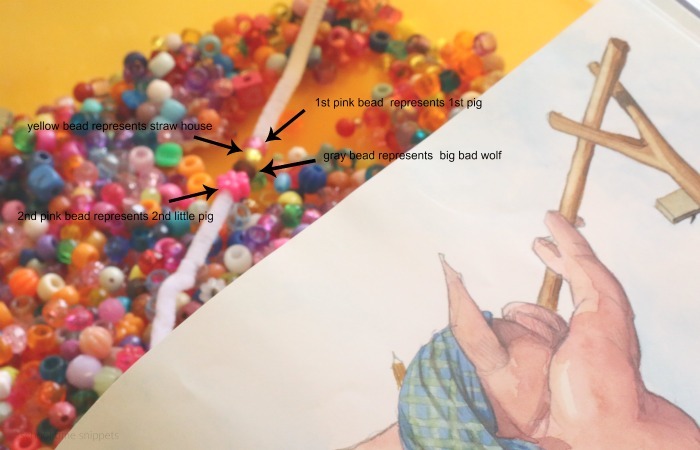 The version of the Three Little Pigs that we read by Barry Moser actually involved a few more incidents where the wolf tried to outsmart the pig, so you could add a few more beads to represent that or simplify the story as we did above to recreate your bracelet. 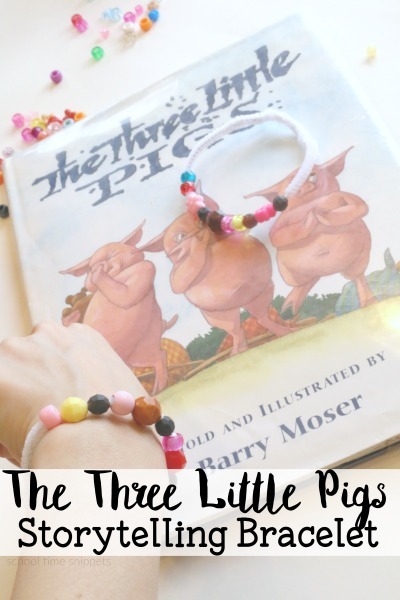 Now, proudly showcase your Three Little Pigs Storytelling Bracelet and use it to help you re-tell the story!